Stourhead in Wiltshire, England, designed by Henry Hoare (1705–1785), "the first landscape gardener, who showed in a single work, genius of the highest order"
Landscape architecture is the design of outdoor areas, landmarks, and structures to achieve environmental, social-behavioural, or aesthetic outcomes. It involves the systematic investigation of existing social, ecological, and soil conditions and processes in the landscape, and the design of interventions that will produce the desired outcome. The scope of the profession includes landscape design; site planning; stormwater management; erosion control; environmental restoration; parks and recreation planning; visual resource management; green infrastructure planning and provision; and private estate and residence landscape master planning and design; all at varying scales of design, planning and management. A practitioner in the profession of landscape architecture is called a landscape architect. Landscape architecture is a multi-disciplinary field, incorporating aspects of botany, horticulture, the fine arts, architecture, industrial design, soil sciences, environmental psychology, geography, ecology, and civil engineering. The activities of a landscape architect can range from the creation of public parks and parkways to site planning for campuses and corporate office parks, from the design of residential estates to the design of civil infrastructure and the management of large wilderness areas or reclamation of degraded landscapes such as mines or landfills. Landscape architects work on structures and external spaces with limitations toward the landscape or park aspect of the design - large or small, urban, suburban and rural, and with "hard" (built) and "soft" (planted) materials, while integrating ecological sustainability. The most valuable contribution can be made at the first stage of a project to generate ideas with technical understanding and creative flair for the design, organization, and use of spaces. The landscape architect can conceive the overall concept and prepare the master plan, from which detailed design drawings and technical specifications are prepared. They can also review proposals to authorize and supervise contracts for the construction work. Other skills include preparing design impact assessments, conducting environmental assessments and audits, and serving as an expert witness at inquiries on land use issues. Stormwater management including rain gardens, green roofs, groundwater recharge, Green infrastructure, and constructed wetlands. Environmental assessment and landscape assessment, planning advice and land management proposals. Landscape managers use their knowledge of landscape processes to advise on the long-term care and development of the landscape. They often work in forestry, nature conservation and agriculture. Landscape scientists have specialist skills such as soil science, hydrology, geomorphology or botany that they relate to the practical problems of landscape work. Their projects can range from site surveys to the ecological assessment of broad areas for planning or management purposes. They may also report on the impact of development or the importance of particular species in a given area. Landscape planners are concerned with landscape planning for the location, scenic, ecological and recreational aspects of urban, rural and coastal land use. Their work is embodied in written statements of policy and strategy, and their remit includes master planning for new developments, landscape evaluations and assessments, and preparing countryside management or policy plans. Some may also apply an additional specialism such as landscape archaeology or law to the process of landscape planning. Green roof (or more specifically, vegetative roof) designers design extensive and intensive roof gardens for storm water management, evapo-transpirative cooling, sustainable architecture, aesthetics, and habitat creation. For the period before 1800, the history of landscape gardening (later called landscape architecture) is largely that of master planning and garden design for manor houses, palaces and royal properties, religious complexes, and centers of government. 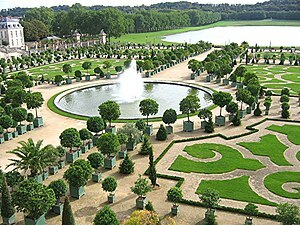 An example is the extensive work by André Le Nôtre at Vaux-le-Vicomte for King Louis XIV of France at the Palace of Versailles. The first person to write of making a landscape was Joseph Addison in 1712. The term landscape architecture was invented by Gilbert Laing Meason in 1828, and John Claudius Loudon (1783–1843) was instrumental in the adoption of the term landscape architecture by the modern profession. He took up the term from Meason and gave it publicity in his Encyclopedias and in his 1840 book on the Landscape Gardening and Landscape Architecture of the Late Humphry Repton. The practice of landscape architecture spread from the Old to the New World. The term "landscape architect" was used as a professional title by Frederick Law Olmsted in the United States in 1863 and Andrew Jackson Downing (1815–1852), another early American landscape designer, was editor of The Horticulturist magazine (1846–52). In 1841 his first book, A Treatise on the Theory and Practice of Landscape Gardening, Adapted to North America, was published to a great success; it was the first book of its kind published in the United States. During the latter 19th century, the term landscape architect begun to be used by professional landscapes designers, and was firmly established after Frederick Law Olmsted, Jr. and Beatrix Jones (later Farrand) with others founded the American Society of Landscape Architects (ASLA) in 1899. IFLA was founded at Cambridge, England, in 1948 with Sir Geoffrey Jellicoe as its first president, representing 15 countries from Europe and North America. Later, in 1978, IFLA's Headquarters were established in Versailles. The combination of the traditional landscape gardening and the emerging city planning combined together gave landscape architecture its unique focus. Frederick Law Olmsted used the term 'landscape architecture' using the word as a profession for the first time when designing the Central Park. Through the 19th century, urban planning became a focal point and central issue in cities. The combination of the tradition of landscape gardening and the emerging field of urban planning offered Landscape Architecture an opportunity to serve these needs. In the second half of the century, Frederick Law Olmsted completed a series of parks which continue to have a huge influence on the practices of Landscape Architecture today. Among these were Central Park in New York City, Prospect Park in Brooklyn, New York and Boston's Emerald Necklace park system. Jens Jensen designed sophisticated and naturalistic urban and regional parks for Chicago, Illinois, and private estates for the Ford family including Fair Lane and Gaukler Point. One of the original eleven founding members of the American Society of Landscape Architects (ASLA), and the only woman, was Beatrix Farrand. She was design consultant for over a dozen universities including: Princeton in Princeton, New Jersey; Yale in New Haven, Connecticut; and the Arnold Arboretum for Harvard in Boston, Massachusetts. Her numerous private estate projects include the landmark Dumbarton Oaks in the Georgetown neighborhood of Washington, D.C.. Since that time, other architects — most notably Ruth Havey and Alden Hopkins—changed certain elements of the Farrand design. Since this period Urban Planning has developed into a separate independent profession that has incorporated important contributions from other fields such as Civil Engineering, Architecture and Public Administration. Urban Planners are qualified to perform tasks independent of landscape architects, and in general, the curriculum of landscape architecture programs do not prepare students to become urban planners. Landscape architecture continues to develop as a design discipline, and to respond to the various movements in architecture and design throughout the 20th and 21st centuries. Thomas Church was a mid-century landscape architect significant in the profession. Roberto Burle Marx in Brazil combined the International style and native Brazilian plants and culture for a new aesthetic. Innovation continues today solving challenging problems with contemporary design solutions for master planning, landscapes, and gardens. Ian McHarg was known for introducing environmental concerns in landscape architecture. He popularized a system of analyzing the layers of a site in order to compile a complete understanding of the qualitative attributes of a place. This system became the foundation of today's Geographic Information Systems (GIS). McHarg would give every qualitative aspect of the site a layer, such as the history, hydrology, topography, vegetation, etc. GIS software is ubiquitously used in the landscape architecture profession today to analyze materials in and on the Earth's surface and is similarly used by Urban Planners, Geographers, Forestry and Natural Resources professionals, etc. In many countries, a professional institute, comprising members of the professional community, exists in order to protect the standing of the profession and promote its interests, and sometimes also regulate the practice of landscape architecture. The standard and strength of legal regulations governing landscape architecture practice varies from nation to nation, with some requiring licensure in order to practice; and some having little or no regulation. In Europe, North America, parts of South America, Australia, India and New Zealand, landscape architecture is a regulated profession. Since 1889, with the arrival of the French architect and urbanist landscaper Carlos Thays, recommended to recreate the National Capital's parks and public gardens, it was consolidated an apprentice and training program in landscaping that eventually became a regulated profession, currently the leading academic institution is the UBA University of Buenos Aires"UBA Facultad de Arquitectura, Diseño y Urbanismo" (Faculty of Architecture, Design and Urbanism) offering a Bacherlor’s degree in Urban Landscaping Design and Planning, the profession itself is regulated by the National Ministry of Urban Planning of Argentina and the Institute of the Buenos Aires Botanical Garden. The Australian Institute of Landscape Architects (AILA) provides accreditation of university degrees and non statutory professional registration for landscape architects. Once recognized by AILA, landscape architects use the title 'Registered Landscape Architect' across the six states and territories within Australia. AILA's system of professional recognition is a national system overseen by the AILA National Office in Canberra. To apply for AILA Registration, an applicant usually needs to satisfy a number of pre-requisites, including university qualification, a minimum number years of practice and a record of professional experience. Landscape Architecture within Australia covers a broad spectrum of planning, design, management and research. From specialist design services for government and private sector developments through to specialist professional advice as an expert witness. In Canada, landscape architecture, like law and medicine, is a self-regulating profession pursuant to provincial statute. For example, Ontario's profession is governed by the Ontario Association of Landscape Architects pursuant to the Ontario Association of Landscape Architects Act. Landscape architects in Ontario, British Columbia, and Alberta must complete the specified components of L.A.R.E (Landscape Architecture Registration Examination) as a prerequisite to full professional standing. Provincial regulatory bodies are members of a national organization, the Canadian Society of Landscape Architects / L'Association des Architectes Paysagistes du Canada (CSLA-AAPC), and individual membership in the CSLA-AAPC is obtained through joining one of the provincial or territorial components. Doctor landscape agronomists and Doctor landscape foresters, often called Landscape agronomists. Agrarian Experts and Graduated Agrarian experts. The New Zealand Institute of Landscape Architects (NZILA) is the professional body for Landscape Architects in NZ www.nzila.co.nz. In April 2013, NZILA jointly with AILA, hosted the 50th International Federation of Landscape Architects (IFLA) World Congress in Auckland, New Zealand. The World Congress is an international conference where Landscape Architects from all around the globe meet to share ideas around a particular topic. Within NZ, Members of NZILA when they achieve their professional standing, can use the title Registered Landscape Architect NZILA. NZILA provides an education policy and an accreditation process to review education programme providers; currently there are three accredited undergraduate Landscape Architecture programmes in New Zealand. Lincoln University also has an accredited masters programme in landscape architecture. The Irish Landscape Institute [ILI] (www.irishlandscapeinstitute.com) is the officially recognized (by the Irish State) professional body representing landscape architects and parks professionals, in both the Republic of Ireland and Northern Ireland. The ILI was formed in 1992 by the merger of the ILHI (Institute of Landscape Horticulture of Ireland) and the IILA (Irish Institute of Landscape Architects), representing the related disciplines of landscape architecture and landscape horticulture. The Institute currently (October 2017) has a total membership of 160 (approx.) within 7 membership categories (student, graduate, affiliate, parks professional, corporate, fellow, honorary). In the absence of state regulation of the profession or title 'landscape architect', ILI is self-regulating, as for example in its adoption of the trade-marked title, 'Registered Landscape Architect', that is solely permissible for use by corporate members. At international level, the ILI is a full member of the International Federation of Landscape Architects (IFLA) through its European Region (IFLA-Europe). The ILI has play a consistent and active role in IFLA and the current president of IFLA-Europe is Irishman and ILI Past President, Mr. Tony Williams MILI. In the Republic of Ireland, the ILI is a member institute of the Urban Forum, which represents 5 built-environment professional bodies in engineering, architecture, planning, quantity surveying and landscape architecture. ILI promotes the landscape profession by its accreditation of the master's degree programme in University College Dublin, its certification of Continuing Professional Development (CPD) for its members, administration of professional practice examinations, advocacy and lobbying in respect of government policies, guidelines and standards (e.g. the National Landscape Strategy, National Planning Framework, Blue-Green Infrastructure), conferences and seminars, public lectures and design awards. The profession grew rapidly during the Irish economic boom of the early 21st. century, benefiting from the upsurge in the construction and development sectors and from the States' capital investment in infrastructure. The recession brought a sharp reduction in membership numbers. The profession and ILI has proven resilient with clear evidence of a slow but steady recovery through growth in membership and in employment, since the commencement of economic recovery in 2014. A key challenge remains: there is still no professional regulation or protection registration of title in Ireland, despite calls for such on successive government by ILI over many years. Therefore, there is no state-guarantee or protection of clients, for example in terms of insuring and verifying educational qualifications, professional indemnity insurance or Continuing Professional Development (CPD) of those claiming to be landscape architects. Notwithstanding this, there is a growing awareness in some important sectors (e.g. government departments, media, construction, tourism) of the profession. This is due - to some degree - to the ongoing work of the ILI in promoting the benefits of landscape architecture to Irish society, economy and environment. Landscape architects in Ireland work in private practice, public sector bodies at local government level and in some state bodies (e.g. transport, national heritage) and in academia. The demand for their professional services is often associated with public infrastructure projects (e.g. roads, motorways, renewable energy facilities, water treatment plants, etc. ), Blue-Green Infrastructure (planning, design and management of parks, greenspaces, amenity trees) and with construction projects related to land use developments, principally residential, commercial and mixed-use developments in urban landscapes. Landscape architects are employed in design of: green infrastructure, public realm, institutional/medical/industrial campuses and settings, parks, play facilities, transport (road/rail/cycle/port) corridors, retail complexes, residential estates (including plans for remediation of now-abandoned housing 'ghost' estates), village improvements, accessibility audits, graveyard restoration schemes, wind farms, wetland drainage systems and coastal zones. They are also significantly employed in preparation/review of statutory impact assessment reports on landscape, visual and ecological impacts of planning proposals. In May 1962, Joane Pim, Ann Sutton, Peter Leutscher and Roelf Botha (considered the forefathers of the profession in South Africa) established the Institute for Landscape Architects, now known as the Institute for Landscape Architecture in South Africa (ILASA). ILASA is a voluntary organisation registered with the South African Council for the Landscape Architectural Profession (SACLAP). It consists of three regional bodies, namely, Gauteng, KwaZula-Natal and the Western Cape. ILASA’s mission is to advance the profession of landscape architecture and uphold high standards of professional service to its members, and to represent the profession of landscape architecture in any matter which may affect the interests of the members of the Institute. ILASA holds the country’s membership with The International Federation of Landscape Architects (IFLA). In South Africa, the profession is regulated by SACLAP, established as a statutory council in terms of Section 2 of the South African Council for the Landscape Architectural Profession Act – Act 45 of 2000. The Council evolved out of the Board of Control for Landscape Architects (BOCLASA), which functioned under the Council of Architects in terms of The Architectural Act, Act 73 of 1970. SACLAP’s mission is to establish, direct, sustain and ensure a high level of professional responsibilities and ethical conduct within the art and science of landscape architecture with honesty, dignity and integrity in the broad interest of public health, safety and welfare of the community. After completion of an accredited under-graduate and/or post-graduate qualification in landscape architecture at either the University of Cape Town or the University of Pretoria, or landscape technology at the Cape Peninsula University of Technology, professional registration is attained via a mandatory mentored candidacy period (minimum of two years) and sitting of the professional registration exam. After successfully completing the exam, the individual is entitled to the status of Professional Landscape Architect or Professional Landscape Technologist. The UK's professional body is the Landscape Institute (LI). It is a chartered body which accredits landscape professionals and university courses. At present there are fifteen accredited programmes in the UK. Membership of the LI is available to students, academics and professionals, and there are over 3,000 professionally qualified members. The Institute provides services to assist members including support and promotion of the work of landscape architects; information and guidance to the public and industry about the specific expertise offered by those in the profession; and training and educational advice to students and professionals looking to build upon their experience. In 2008, the LI launched a major recruitment drive entitled "I want to be a Landscape Architect" to encourage the study of Landscape Architecture. The campaign aimed to raise the profile of landscape architecture and highlight its valuable role in building sustainable communities and fighting climate change. As of July 2018, the "I want to be a Landscape Architect" initiative was replaced by a brand new careers campaign entitled #ChooseLandscape, which aims to raise awareness of landscape as a profession; improve and increase access to landscape education; and inspire young people to choose landscape as a career. This new campaign includes other landscape-related professions such as landscape management, landscape planning, landscape science and urban design. In the United States, Landscape Architecture is regulated by individual state governments. For a landscape architect, obtaining licensure requires advanced education and work experience, plus passage of the national examination called The Landscape Architect Registration Examination (L.A.R.E.). Several states require passage of a state exam as well. In the United States licensing is overseen both at the state level, and nationally by the Council of Landscape Architectural Registration Boards (CLARB). Landscape architecture has been identified as an above-average growth profession by the US Bureau of Labor Statistics and was listed in U.S. News & World Report's list of Best Jobs to Have in 2006, 2007, 2008, 2009 and 2010. The national trade association for United States landscape architects is the American Society of Landscape Architects. ^ Hyams, Edward (1971). A History of Gardens and Gardening. New York, Washington: Praeger Publishers. p. 239. ^ "Landscape Architecture - Your Environment. Designed". Asla.org. Retrieved 6 April 2013. ^ "Extensive Vegetative Roofs | Whole Building Design Guide". www.wbdg.org. Retrieved 28 December 2015. ^ "History of Horticulture". Ohio State University. Archived from the original on 16 July 2012. Retrieved 24 July 2012. ^ National Park Service (2000). Cultural Landscape Report: Dumbarton Oaks Park, Rock Creek Park. Washington, D.C.: U.S. Dept. of the Interior. ^ "Bulletin of Information for the AICP Comprehensive Planning Examination" (PDF). www.planning.org. Retrieved 29 August 2016. There are important distinctions between planners and allied professionals and between planning and related fields. Planners approach problems comprehensively, have a long-range perspective, and deal with unique place-based issues. Although people in related professions (e.g., law, architecture, landscape architecture, engineering, real estate development, etc.) and disciplines (humanities, psychology, etc.) often work with planners, they do not necessarily have the same knowledge base, skillset, and approach. ^ Corbett, John. "Ian McHarg: Overlay Maps and the Evaluation of Social and Environmental Costs of Land Use Change". Center for Spatially Integrated Social Science. Retrieved 4 June 2014. ^ Ozio, Ron (6 March 2001). "Obituary: Ian McHarg Dies". Penn News. University of Pennsylvania. Retrieved 4 June 2014. ^ "The Ontario Association of Landscape Architects". Oala.on.ca. Retrieved 6 April 2013. ^ "The South African Council for the Landscape Architectural Profession (SACLAP) - Home". saclap.org.za. Retrieved 31 January 2019. ^ "IFLA World · International Federation of Landscape Architects". Retrieved 31 January 2019. ^ "CC Position Statement". landscapeinstitute.org. 2011. Archived from the original on 13 June 2011. Retrieved 30 May 2011. ^ Gosling, Ben. "#ChooseLandscape launches next month – here's how to get involved | Landscape Institute". Retrieved 31 January 2019. ^ "Choose Your Career – Chooselandscape". Retrieved 31 January 2019. ^ "Career Advice and Guide for Job Searches - US News Business". Money.usnews.com. Retrieved 6 April 2013. This page was last edited on 27 March 2019, at 23:07 (UTC).